This past November, all school roads led to the State Association Hockey Stadium in Langford Town, Bangalore. 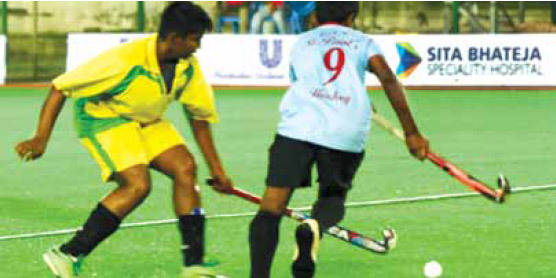 It was the 4th edition of the inter-school hockey tournament conducted by the Jude Felix Hockey Academy. What’s more, it was in aid of the girl child. While Jude Felix is certainly recognised for his outstanding sporting achievements, his charitable trust is less well-known despite the great work they are doing. Started in January 2009, the Jude Felix Hockey Academy (JFHA), Charitable Trust (Regd. ), is a non profit organization started in January 2009 by former international and national players to promote the game of hockey amongst the under-privileged children in our country at large and develop new talent for the game. And they’ve certainly been true to that. each from Hyderabad and Chennai, apart from St Josephs, Briand Square, St. Patrick’s School and Vidyashilp Academy. In the end, it was KV Hyderabad who took the trophy, beating the brave team of Maria Niketan 4-0 in the final.